Notes: Special thanks to Wes Boyd for the info on this. 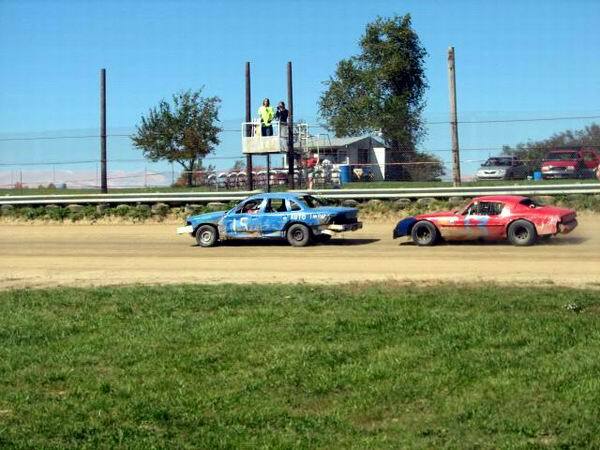 There is still at least one race left at Evergreen this weekend(Oct 13-14) it''s their annual Octoberfest race, a 2 day event with many classes running and free primitive camping. Check out their website. Their is also a possibility of renting a FWD car for the weekend See you there. Dude I am sooooo there next year. Hidden well off a gravel road just over the state line from Pioneer, OH, Evergreen Auto Park is a slice of local dirt track auto racing like it used to be. It's a down-home place where friends pitch in to have a good time, where things are relaxed and casual. On Sunday afternoons a handful of dirt track racers, family, friends and fans get together to do more than watch a race, but to be a part of it. Its like you stepped back in time to the way racing was in the 60's, only with modern cars, says Patrick McNamara of Grass Lake, an Evergreen regular. Although the track is nearly unknown, it's actually been there nearly thirty years. 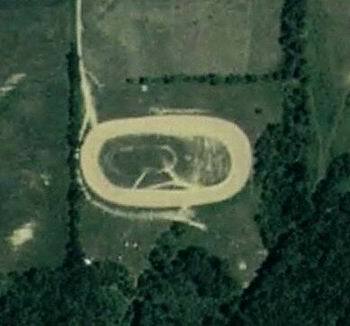 The quarter-mile track was originally built in 1979 by Arnie Miller so his son, Hillard Miller could use it to test and tune his race car -- Late Model #53 at Oak Shade, for those race fans with long memories. It was still occasionally used for the same purpose when Dan and Lois Griner of Whitehouse, Ohio, heard about it. Dan ran Evergreen Auto Parts in Whitehouse, had often sponsored race cars and had run some himself from time to time. He and Lois figured that running a race track would make a fine retirement hobby, and acquired it in 2001. There has been occasional racing for the last four years, although this is the first year that the Griners and their friends are trying to run a full racing season. A considerable amount of work has been needed to turn a quiet little testing track into a place that holds racing regularly. Since the whole project has been done on a shoestring, sweat equity and volunteers have been more involved than cash. A little bit gets done every week, Dan says. The track had to be slightly reshaped, walls of old tires moved, and a catch fence installed in front of the spectator area. There are no bleachers -- yet, anyway; Dan's got the parts for a set of bleachers stashed in a barn, but says they need some repair before they can be erected. In the meantime, spectators are asked to bring their lawn chairs to supplement the thirty or so folding chairs someone turned up somewhere for the sake of the spectators. But, the grounds are neat, well mowed and well picked up because the volunteers that have put time into the track are proud of their efforts. For a number of reasons it's nowhere near as dusty and dirty as larger dirt tracks. There are no lights at the track -- no power for that matter, except for a small portable generator -- so racing action is restricted to Sunday afternoons. Keeping a dirt track wet enough to keep the dust down yet dry enough to race as an art on the best of occasions -- it's even harder on a warm, sunny, breezy afternoon, so there are occasionally long breaks between heats -- but then, no one seems to mind because it leaves plenty of time for bench racing in the pits behind the spectator area overlooking the track, or for admiring a spectator's tiny new puppy making its first track outing. The track normally runs races for Street Stocks, Micro-Sprints and Sportsmans, although last Sunday there was a lack of the latter two and only a handful of the former, as several regulars were attending a major race at Mid-Michigan Speedway and several others had cars that were still in the process of recovering from a series of fender-benders from the week before. 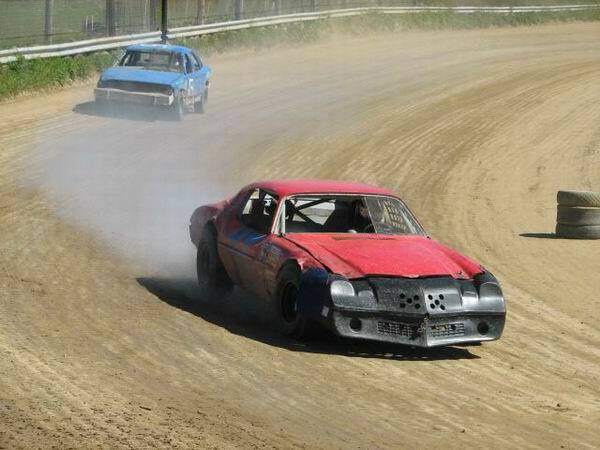 Streets are the major stock in racing at Evergreen -- normal cars of indeterminate but elderly age, unmodified except for having the interiors and other useless weight stripped out, and a roll cage and other safety equipment added. The action can be close and furious, and the track is small enough that it's always right in front of you. Evergreen Auto Park is located at 4351 Miller Road about half a mile west of M-99. Miller Road is a mile south of Camden Road or two miles north of Territorial Road. Normally, gates open at 10:00 AM, hot laps start at noon and racing at 1:00 PM.